Pink is the new color of passion and this stunning pink topaz and diamond ring is the perfect expression of that spirit with its powerful color and refined details. 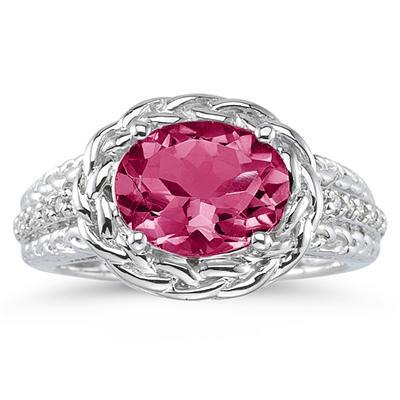 The pink topaz gemstone is oval cut for a special design and brings a rosy hue to the ring. A base of 10K white gold keeps the look modern and features a chain design that's delicately crafted into the band. To complete this beautiful ring, 12 diamonds in total are prong set into the white gold band for just the right hint of sparkle. We guarantee our 2.33 Carat Oval Shape Pink Topaz and Diamond Ring in 10K White Gold to be high quality, authentic jewelry, as described above.